Photo courtesy of BRANT OSWALD FLY FISHING. Spring season is a delightful time for local area anglers—the opportunity to ski exists for a few weeks, spring-time hatches run the gamut from Blue Winged Olives to March browns to skwalas to caddis, and trout are hungry and plentiful in our local waters. Yet one of the reasons our local trout are hungry is due to the abundance of rainbow trout staging to spawn, actively spawning, or recovering from spawning. Except for a strain of rainbow trout in the Upper Kootenai River drainage, all of the rainbow trout in Montana were introduced as stocked fish as early as 1889. Despite the species dominance over native cutthroat trout causing a decline in cutthroat populations, rainbow trout are a sought-after gamefish in our local waters. They are a resilient species, but an awareness of their spawning habitat and behavior is crucial to protecting healthy populations. Know spawning habitat and seasons. Rainbow trout will spawn in main river channels, side channels and smaller tributaries. Most of our local rainbow trout will begin spawning in early April and will continue well into May. They prefer areas of a river with small gravels between 1/2- and 3-inches in size. Using her tail, a female rainbow trout digs a depression in the small gravel, called a “redd.” These redds are recognizable as lighter patches of river bottom, a result of the female exposing the slightly buried gravel. Riffle and pool tail-out habitats with well-aerated gravels free of sediment are ideal spawning habitat. Don’t tread on the redds. Redds are the future of our rainbow trout fisheries, so stay clear of them. A female deposits a portion of her eggs into the redd, as an attending male fertilizes them. The fertilized eggs are covered by gravel as the female excavates yet another redd just upstream. Trout deposit eggs throughout a range of depths and current velocities to ensure viable reproduction—a sort of hedging of their bets. Sufficient water depth and sediment-free spawning gravels are critical to ensure that water can percolate through the spaces in the gravel, bringing oxygen to the eggs and removing metabolic wastes associated with incubation and hatching. After hatching, young trout remain in the gravel until most of the yolk reserves they are born with are used up. For these reasons know what a redd looks like and do not wade on or even near them. Target non-spawning species. With an abundance of spawning rainbow trout, brown trout will opportunistically position themselves downstream of redds. 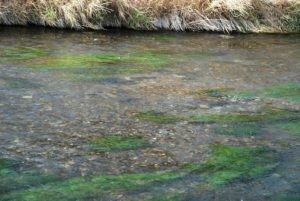 Now that you know how to look for redds, you can target actively feeding brown trout downstream of redds without disrupting actively spawning rainbow trout. If you do catch a spawning fish, practice proper catch and release tactics by bringing them in as quickly as possible, keeping them in the water at all times, do not photograph them, and release them near their redd as quickly as possible—all while not physically disrupting the redds. Exercise special caution on a few of our local waters. The Upper Madison River, the Gallatin River, and the Paradise Valley spring creeks, all feature healthy populations of rainbow trout, yet all are open to fishing during spawning season. The Upper Madison downstream from Quake Lake to around Ruby Creek Campground is vital spawning habitat for the entire river system. If you fish it regularly, educate yourself and steer clear of redds. The Gallatin River is a mountain freestone, so many of its trout spawn in deeper runs and holes, and inadvertent damage to redds is minimal; yet an unaware angler can still damage them. One spot in particular is the river near Snowflake Springs near the Yellowstone Park boundary. The Paradise Valley spring creeks are an incubator for Yellowstone River rainbow trout, and the owners of the creeks do a fine job of posting sensitive areas. Fly fishing shouldn’t feel like school or a pastime in which someone tells you what to do—many of us go fishing to get away from feeling that level of responsibility. However, in order to maintain healthy fish populations, we all need to practice responsible fishing, and that means steering clear of spawning fish and their spawning habitat.